Sometimes it’s just more fun training together. There are people who do every one of their workouts with a group. Race Day Coaching offers a number of group training sessions throughout the year, through several different clubs and facilities. Team In Training – The Leukemia & Lymphoma Society has been raising money to fight blood related cancers for many years and has taken many new triathletes, cyclists, and marathoners through successful training programs and races. Long endurance events are difficult, but we prepare you completely from start to finish, ending with the unmatched feeling of accomplishment that you’ve not only completed your event, but saved lives along the way. JackRabbit Swim Programs – A staple of many a weekly swim training program, we offer beginning, intermediate, and advanced classes that focus on freestyle. Swim I is exclusively form-focused and every detail of the stroke is taught. Swim II is a mix of skill work, distance swims, and an introduction to speed work. Swim III is for those who want to push the limits of their endurance with sets to test form at higher intensities. Masters Swims at Berkeley Carroll – Held from 6-7am on Tuesday, Wednesday, Thursday, and Friday, these workouts are for anyone (swimmers and triathletes alike) interested in swimming better and mastering all four competitive strokes. We swim 1800-2800yds in the hour with a wide variety of sets and drills. Training Camps at Open Sky Training - You’ve always wanted a camp experience like this. Train like a pro. Meet great friends. Eat like (the most healthy) royalty. Sleep like a baby. And take your race prep and endurance to a new level. Brick Workouts with the Brooklyn Tri Club – Once spring rolls around and we have daylight in the mornings, the bricks will begin. From 6-730am, come and work on your bike to run transitions in workouts designed to test and improve every aspect of race readiness. 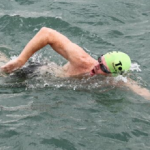 Open Water Swims at Brighton Beach / Coney Island – Between holidays each summer, the lifeguards are out and we do group swims at NYC’s best beach for open water swim training. On any given day you’ll see people training for channel crossings or MIMS or their first triathlon. We lead groups by request, through JackRabbit Sports, or the Brooklyn Tri Club almost every weekend.